October corn yield forecast for Iowa dropped to 169 bushels per acre, a significant reduction from the August and September forecasts of 179 bushels per acre (see October USDA-NASS forecast). If realized, 2010 yields will rank sixth among the last seven years, higher only than the yields of 2006 (166 bushels per acre). Numerous published and anecdotal yield reports substantiate lower than expected yields this year. In previous 2010 Integrated Crop Management News articles, we've addressed 2010 conditions and the possibility of reduced yields resulting from rapid crop development following silking (see September 28 article). Statewide Growing Degree Day accumulations were 116 percent of normal during most of the seed fill period — silk to dent — this year. In 2009 Elwynn Taylor and I discussed the impacts of temperatures during the seed fill in an August 3 ICM article. We wrote, "Warm night-time temperature even when day-time heat is not excessive tends to reduce yield by shortening the filling period. Cool night-time temperatures after silking are associated with the higher yielding years in Iowa." Cool night temperatures after silking in 2009 resulted in the highest average yield ever recorded in Iowa, 182 bushels per acre. Crop simulation models help us understand the impacts of different temperatures during the seed-fill period. Were warm night temperatures between silking and dent in 2010 responsible for the recent low USDA-NASS yield forecasts and reports of lower than expected yields from many other sources? A computer model, Hybrid-Maize, was used to predict yields and development rates for corn at five Iowa State University Research and Development Farms. The crop model helps us better understand the interaction between management, genetics and weather by allowing users to fix management practices and hybrids - planting or emergence date, plant population, water regime, and crop heat unit requirements. Thus, the model allows us to compare weather across years without other factors affecting the results. It predicts the maximum yield possible given the weather conditions experienced in the current or previous years; it does not account for other limiting factors like diseases, insects, low N availability, greensnap, stalk lodging, etc. The simulations used actual weather data collected by automated weather stations at each of the locations through Sunday, Oct. 3, 2010; 97 percent of Iowa's corn was mature at that time (see USDA-NASS Crops & Weather Report). • Emergence date: May 10; this approximates the statewide average for 2010. To test the hypothesis that warm 2010 minimum temperatures (Tmin) between silking and dent reduced yield potential, two sets of simulations were performed. In the first simulations the actual Tmin for 2010 was used in the model, labeled "2010." In the second, Tmin was altered by replacing the minimum average daily temperatures between July 15 and August 15, 2010 with the same values from the 2009 growing season, labeled as the "2010 Tmin Alt" simulations. The period July 15 to August 15, 2010 corresponds approximately to this year's statewide averages for the period between silking and dent. 2010 and "2010 Tmin Alt" comparisons (Table 1 and Figure 1): Minimum temperatures (Tmin) in the '2010 Tmin Alt' simulation by intent matched those of the July 15 to August 15, 2009 period and were about 8 degrees cooler than those actually recorded in 2010. Reducing these 2010 night temperatures increased the seed-fill period by 6 to 13 days. Yield simulations for 2010 with actual minimum temperatures ranged between 5 to 13 percent below those where Tmin values were altered to match those of 2009 (Figure 1). These simulated yield reductions during seed fill are due to either fewer kernels per ear, decreased kernel weights or both. USDA-NASS yield forecasts earlier in the growing season are not able to predict either of these variables with precision. Were the warm night temperatures between silking and dent in 2010 responsible for the low yield forecasts and reports of lower than expected yields? Yes. Table 1. 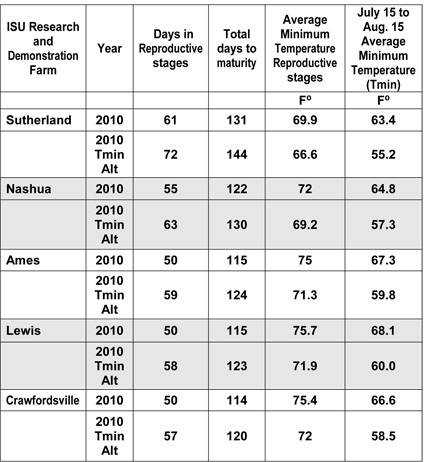 Simulated corn yields, days in reproductive stages, and total days to maturity, as well as actual temperatures between silking and dent at five Iowa State University Research and Demonstration Farms. Simulations conducted with Hybrid-Maize; actual weather data from Mesonet. Figure 1. Simulated 2010 corn yields at five Iowa State University Research and Development compared to "2010 Tmin Alt" yields. "2010 Tmin Alt" was simulated by altering minimum temperatures during early- to mid-seed fill — silk to dent, July 15 to Aug. 15, 2010 — to match those of the same dates in 2009. Simulations were conducted with Hybrid-Maize. Yields are in percentages where those of 2010 = 100%. Roger Elmore is a professor of agronomy with research and extension responsibilities in corn production. Elmore can be contacted by email at relmore@iastate.edu or (515) 294-6655. Links to this article are strongly encouraged, and this article may be republished without further permission if published as written and if credit is given to the author, Integrated Crop Management News, and Iowa State University Extension and Outreach. If this article is to be used in any other manner, permission from the author is required. This article was originally published on October 9, 2010. The information contained within may not be the most current and accurate depending on when it is accessed.